Distinctive Auto Works opened in Calgary in 1975 in response to the growing need for an auto body repair facility with the skills, experience and product knowledge to service luxury cars, and in particular, Mercedes-Benz. In 2008, it became part of an organization with a long and respected pedigree of autobody repair: North Vancouver-based Craftsman Group of Companies, which owns and operates 42 multi award-winning auto body repair facilities in Alberta, British Columbia, Saskatchewan and California. Today, MB Autoworks formerly Distinctive Auto Works in Calgary, Alberta is a leading Mercedes-Benz bodyshop, with a full staff of painters, body technicians and equipment approved by the legendary German marque. As the sole autobody facility in Calgary certified by Mercedes-Benz, we handle all of Mercedes’ autobody-related warranty claims. Many of our non-warranty-related customers come from direct referral by Mercedes-Benz dealerships as well, or from private insurance companies including Intact Insurance. In 2013, we expanded to a second location in Victoria, BC, in response to the need for a factory-authorized repair facility for that other famous German marques. Distinctive Auto Works in Victoria is factory certified for all levels of body repair and painting by the BMW Group (including MINI) and Porsche – and it is the only BMW Group and Porsche Certified Collision Repair Centre on Vancouver Island. In 2016, we have continued our growth to include a Distinctive Auto Works in Edmonton. 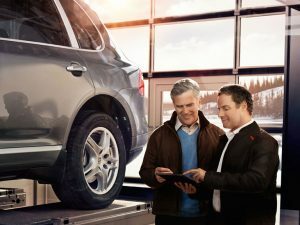 This state of the art, 24,000 square foot facility is the newest Certified Collision Repair Centre in Edmonton for Audi, the BMW Group, Jaguar, Land Rover and Porsche. As luxury car collision experts, you can be assured your vehicle will be repaired using the highest standards. The Craftsman Group of Companies is a family affair, headed by founder and President Bill Hatswell. Part of the Craftsman Group is the well known auto body repair brand, Craftsman Collision. It is the largest independently owned bodyshop chain in Canada. In the Lower Mainland and the interior of BC it consistently tops surveys by media and by the prestigious Consumer Choice Award group for the past 17 years running.